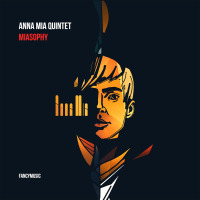 The music heard on Miasophy by Ukrainian singer Anna Mia and her distinctly ethereal quintet is a haunting, robustly compelling listen. Like spectral apparitions, her voice and the band conjure oddly shadowed, yet decisively intimate cabaret atmospheres, drawing you back to the whole or a particular song when you least expect it. The band, trumpeter Yakov Tsvetinsky , keyboardist Mikhail Lyshenko , double bassist Yury Natsvlishvili, and drummer Arthur Frolov are an energetically resilient combo, creating for Mia and her deceptively jazz/pop compositions a live, on-the-spot late night palette of swing, soul, trad jazz, a tad of hip- hop, and smoke. Singing in her native tongue and very comfortably in English, Anna Mia's vocals take hold with a heated but Zen-like emotionalism, undulating with the music, coalescing in a captivating, vivacious whole that reflects, as she explains in the liner notes, "a beauty invented everyday." Calmly stretching phrases at will, cutting them short, playing tag-your-it, hide-and-seek with pianist Lyshenko and bassist Natvlishvili, makes "Lost Song," "Plachu," the bubbling "The Light," the effortless swing of "Character," and the multiple moods and movements of "Listen, Look, Come." Tsvetinsky shines brightly here in the slower moments before the whole band breaks into a post-modern jam, eliciting repeated listens. Track Listing: Walk of Freedom; Вода; Lost Song; Плачу; The Light; Listen, Look, Come; Character; Good Morning. 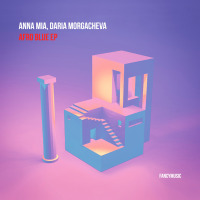 Personnel: Anna Mia: vocals; Yakov Tsvetinsky: trumpet; Mikhail Lyshenko: keys; Yury Natsvlishvili: doublebass; Arthur Frolov: drums.